One of the most interesting facts about Niagara Falls is that it spans two countries, the United States and Canada. It’s a very spectacular feeling to be able to look across one of the world’s most beautiful waterfalls and see the shores of an entirely different country. Of course, if you plan to visit the side of Niagara Falls that your country doesn’t claim you will have to pay a visit to immigration but despite what some may think this is generally a quick and easy process. U.S. visitors need only a passport or an enhanced driver’s license and U.S. children under 16 need only a certified birth certificate. Canadian adults traveling to the US need only a passport or NEXUS card and children younger than 15 need only a birth certificate or Canadian citizenship card. Officials on both sides of the border do their best to make the process as simple as possible for all parties. However, as many times as you look across the river at that other country it’s never the same as visiting in person. 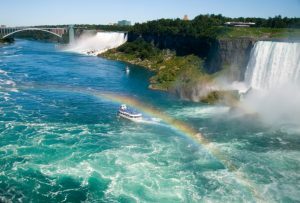 So if you’re planning a visit to Niagara Falls these are just a few of the reasons that you’ll want to visit both sides and double your fun. 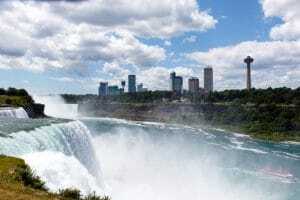 Niagara Falls, New York is an easy driving destination for U.S. citizens who live on the eastern seaboard and a relatively quick flight for those living in the western or southern portions of the country. Niagara Falls, NY, attractions are plentiful and include activities that appeal to adults and children alike. No matter the season you’ll find plenty of things to do on the New York side of the falls. If you’re the type who likes to try your luck at the gaming tables then Seneca Niagara Resort and Casino is the place for you. Featuring all of your favorite games of chance from poker to slot machines this modern casino is one of the most popular in the area. They also feature world-class entertainment including an appearance by Kiefer Sutherland on February 18 and The Temptations on May 12. Check their website for more information. If you have a budding scientist in your family or just like to see how things work a tour of the NYPA Niagara Power Project is one of the best Niagara Falls attractions. The plant features more than 50 interactive displays highlighting the wonders of hydroelectricity. It also features an observation deck 350 feet above the Niagara Gorge. Adrenaline junkies, this one’s for you. Specially designed jetboats take you down the Niagara River to Devil’s Hole where you’ll experience what few people ever do, class V rapids, which is usually only the realm of highly experienced whitewater rafters. This boat, however, is nothing like that. Experience the thrill of the roaring water safely but remember, you will get wet. The Canadian side of the falls also has its own unique experiences and given its proximity to Toronto it’s a favorite vacation spot for Canadians. For the foreign visitor it’s a great way to not only see a different perspective of the falls but to get a little taste of Canadian culture as well. And yes, poutine is a culture. Like its U.S. counterpart, Fallsview Casino is one of the most popular Niagara Falls Canada attractions. Again, they offer all the gaming options you love but their entertainment lineup is always a star studded experience. Art Garfunkel plays on February 25 and Kool & the Gang play on April 21 and 22. Be sure to visit their website for ticket information. The Niagara region is one of Canada’s most important agricultural regions and local chefs have pioneered the farm to table movement here. Be sure to book a table at Windows by Jamie Kennedy or at the Rainbow Room by Massimo Capra. Both restaurants highlight the exceptional produce, meats, and wines of the region. Some of the most unique wines in the world are produced in Niagara, including the famous ice wine. Tours of the local wineries are a wonderful way to spend an afternoon or a whole day. Many wineries offer simple hors d’oeuvres to pair with your tastings and others offer five course meals expertly prepared to highlight the wines they’re paired with. This is one of the Niagara Falls attractions you won’t want to miss. A visit to Niagara really isn’t complete without experiencing both sides of the falls. So when you plan your next visit be sure to include activities on each side of the border and have twice the fun.